Fall means two of my absolutely favorite things in the World: Halloween and Football. 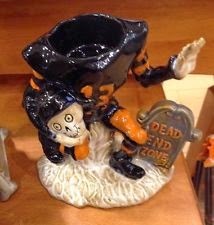 This year for their annual Halloween series Yankee Candle has decided to combine both with the Dead End Zone. The headless player stands about 5 inches tall and was one of the sturdiest pieces in this year's Yankee Candle Halloween line. The candle is designed for a tea light either authentic or electronic. The Legendary Candle company does a great job with these as you can see the little touches that set these pieces apart such as: the #13 jersey and the Dead End Zone play on words on the tombstone. You also have to love how the headless player cradles his head like a pigskin with an old school helmet to top it all off. This line from Yankee Candle is the perfect blend of slightly horrific and the cutesy Halloween that alot of families are looking for. Thus making it the perfect first Halloween decoration for my fiancee' and I's new home. 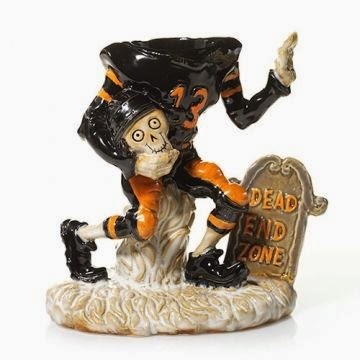 If you would like to score in the Dead End Zone this Halloween season you can pick up this guy for $20 at YankeeCanlde.com, Also if you spend over $35 dollar at Yankee Candle now you get $25 grave candy dish in this line for only $10.